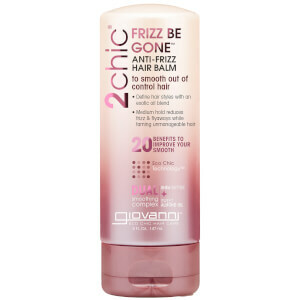 Achieve sleek, smooth locks with Giovanni 2chic Frizz Be Gone Leave-In Conditioner; a multi-beneficial elixir that detangles, hydrates and tames frizz for a salon-worthy finish. Combining Shea Butter with nourishing oils of Macadamia, Argan, Moringa and Sweet Almond, the luxurious formula delivers superior frizz protection, whilst infusing hair with long-lasting moisture, shine and definition. Ideal for textured, curly hair types. Distribute evenly through damp hair. 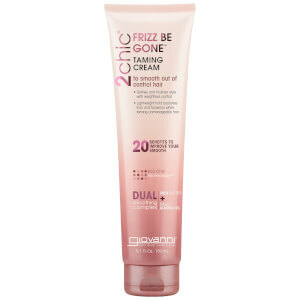 Comb out or style as desired for frizz-free hair. Aqua (Purified Water), Cetyl Alcohol, Isopropyl Palmitate, Dimethicone, Dimethiconol, Butyrospermum Parkii (Shea) Butter Extract, Prunus Amygdalus Dulcis (Sweet Almond) Oil, *Macadamia Ternifolia Seed Oil, *Argania Spinosa Kernel Oil, *Adansonia Digitata (Baobab) Seed Oil, *Moringa Oleifera Seed Oil, *Simmondsia Chinensis (Jojoba) Seed Oil, *Cocos Nucifera (Coconut) Oil, Fragrance, Glyceryl Stearate, Polysorbate 60, Guar Hydroxypropyltrimonium Chloride, Phenoxyethanol, Ethylhexylglycerin, Cetrimonium Bromide.